"How Do We Know What to Design? How Linear Can the Design Process Be?" Most engineers seem to have an implicit rational model of the design process, that starts with requirements and objectives, proceeds to a design concept, then gets detailed, delivered, and maintained. Set forth in the 1960s-1970s by Herbert Simon, Pahl & Beitz, and Winston Royce (as the Waterfall Model in software), this model has dominated our thinking and even our formal processes. We will examine what's right with this model and what's wrong with it. 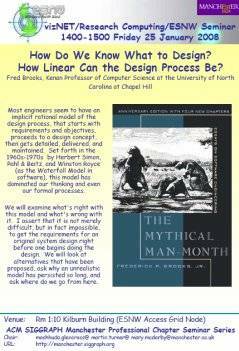 I assert that it is not merely difficult, but in fact impossible, to get the requirements for an original system design right before one begins doing the design. We will look at alternatives that have been proposed, ask why an unrealistic model has persisted so long, and ask where do we go from here. Anyone wishing to view a seminar via Access Grid should note the following. Please check the Jabber room shortly before the start of the seminar.